In the previous section , Data Drive with excel-1, we have set the stage on using object repository and data helper. In this section, we will take an example and see how we put the data-driven concepts/capability to use. We will fill a contact us form on http://automationpractice.com website with different data sets. The contact form looks as below with many input fields. 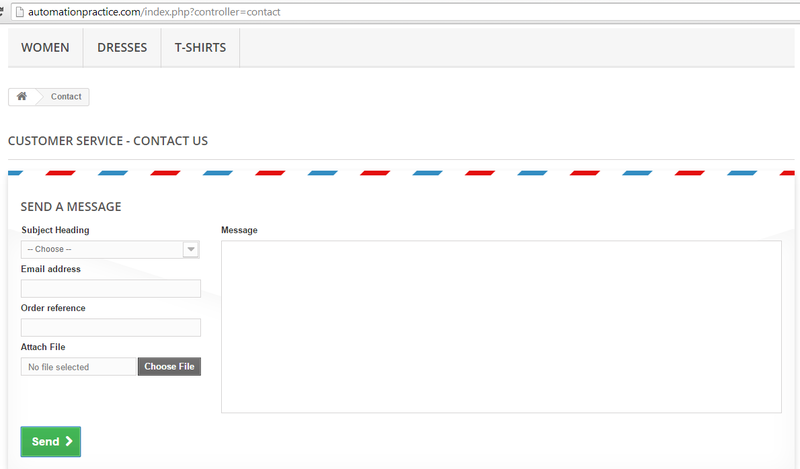 Then click “Contact us” button at the right top corner, which will take us to contact form. We will input all the necessary values and eventually click submit. The simple cucumber scenario when written might look as below. I want to use the data from row “1” of the excel workbook and I would go with the default workbook i.e. default.xlsx. We will inspect the html elements and use the “id” attributes for each of the fields viz. heading, email, order reference, message and submit button. The file “lib/config/object_repository.yml” looks as below. We are also printing the object repository values in the cucumber scenario, so on the output window or results , you can see what values were used. We will use the data excel ‘lib/config/default.xlsx’ file and the file looks as below [We will post the entire project codebase at the end of this section in case you want to download the excel file]. We are also printing the current data set used by the scenario inside step_definitions, so that we know which data set was used. The second cucumber scenario outline uses multiple data sets and repeats the operations for each data set. This is just to show how data “drives” the test case execution. Now we have a data_set which is a hash that contains the first data set from above excel workbook (if row_index=2). The step_definition code is posted below, so you will know the exact values of the arguments inside the code. If you intend to change and use data from another excel workbook, then put the excel workbook inside ‘/lib/config/data’ folder and set it in cucumber.yml file as below. Let’s say your new workbook is “beta_data.xlsx”. This file will override the “default.xlsx” and the code will use beta_data.xlsx file. puts "Printing current data set..."
As we see, we have externalized data with multiple data formats, though we were a little biased towards excel since many companies still use excel. That said, we have just read data from excel into hash, after that we can do pretty much anything with the data structure. In the next section, we will use YAML, which is inbuilt into Ruby and see how easy it gets. Feel free to check out the entire project code base from my github repo: data_driven_framework. Instructions on how to run the project is in README.md file or if you read it directly on github project page. The code base contains YAML data driven examples too, however you will be able to figure out which one to use for excel.